Russia has been repeatedly accused of interfering in recent elections. But Sweden is determined it won't fall victim to any such meddling - with millions of leaflets being distributed and propaganda-spotting lessons for students. As campaigning intensified in the French election, the team of now President Emmanuel Macron said it was a target for "fake news" by Russian media and the victim of "hundreds if not thousands" of cyber-attacks from inside Russia. In Washington, sanctions were recently imposed on 19 Russians accused of interference in the 2016 US election and "destructive" cyber-attacks. While the Kremlin denies interfering in foreign elections - with Vladimir Putin saying there is "nothing to discuss" - concerns remain. With a new prime minister and parliament to be elected in September, Sweden is already working hard to make sure its polls are free from any meddling. If successful, its efforts could serve as a guide for other elections, including the US mid-terms in November. Sweden, a country of 10 million people, has good reason to take action. In 2014, it moved further from its historic position of neutrality to officially become an "enhanced partner" of Nato, which considers Russia's annexation of Crimea to be illegal. Officials have reported an increase in hacking and dissemination of fake news. The aim, they say, is to undermine the stability of Swedish society and spread falsehoods. A study by researchers at the Swedish Institute of International Affairs reported a "wide array" of Russian actions to influence public opinion. It suggested there had been misleading media reports and that fake news was being used to "frame Nato as an aggressor and military threat, the EU as in terminal decline, and Russia as under siege from hostile Western governments". And earlier this year Anders Thornberg, head of Sweden's security service, spoke to the BBC about its fears of foreign political interference, saying: "The biggest threat to our security in that perspective is Russia." Having seen elections elsewhere in the West targeted by cyber-attacks and disinformation, Swedish officials are taking the possibility of Russian meddling seriously. Protecting the democratic system has been placed at the heart of its national security objectives. Sweden's approach involves government working with the private sector, social media companies, broadcasters and newspapers. A "Facebook hotline " has been created to allow officials to quickly report fake Swedish government Facebook pages. 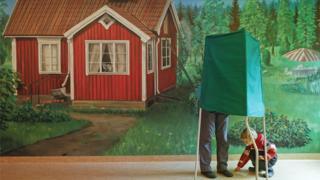 Facebook itself has pledged to report suspicious behaviour around the election to Swedish authorities. A nationwide education programme has been launched to teach high school students about propaganda and a leaflet distributed to 4.7 million homes includes tips on spotting such misinformation. Some 7,000 government officials have received basic training in spotting "influence operations" and how they could put the elections at risk. Public awareness has been raised further by the willingness of Swedish officials at all levels of government to discuss openly the threat of interference. Prime Minister Stefan Lofven has called attempts to meddle in the elections "completely unacceptable" and has pledged to expose them "without mercy". Cyber-security is being improved across government and work is under way to raise awareness of the risks of hacking and disinformation. It is not only Sweden that is taking action, with other countries drawing similar conclusions about the possibility of Russian interference. During Europe's "super election year" of 2017, the governments of the Netherlands, France and Germany all made significant efforts to protect themselves. Dutch officials decided to abandon electronic counting of ballots for fears over hacking, for example. The German and French governments are considering new laws to make social media and technology companies responsible for tackling fake news. It could be that such efforts are having an impact. Despite the hack of the German parliament in 2015, no significant attempts to interfere in the country's September 2017 elections were reported. Other countries have warned Russia against election meddling, with UK Prime Minister Theresa May arguing that it was trying to "undermine free soci eties" by "planting fake stories". Nevertheless, the possibility of Russian interference remains a serious challenge, both in Europe and the US, as well as other parts of the world such as Latin America. Dan Coats, the US director of national intelligence, has warned: "There should be no doubt that Russia perceives its past efforts as successful and views the 2018 US mid-term elections as a potential target." Countries might want to consider sharing best practices and lessons learned if they are to ensure their polls are free and fair. The possibility of Russian interference in elections is likely to remain a serious challenge for some time. The world will be watching to see whether Sweden's tactics work and what can b e learned from them. Erik Brattberg is director of the Europe Program at the Carnegie Endowment for International Peace, while Tim Maurer is co-director of its Cyber Policy Initiative. This article is based on their report "Russian Election Interference: Europe's Counter to Fake News and Cyber Attacks". More details about the work of the Carnegie Endowment for International Peace can be found here. Talks on preparing a summit with the US are under way in New York, Singapore and on the Korean border. Do these photos change your view of pigeons?